Adjustable cheek-pieces have become more and more popular, especially as the objectives on the scopes have grown to 50mm, 56mm, and beyond. In order to get a good cheek weld while keeping the eye in line with the scope a raised cheek-piece has been required. 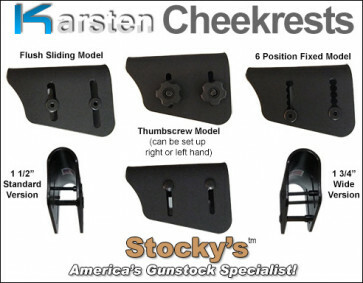 This solves a common problem, Karsten's famous cheekrest can be installed on any standard fixed stock. Adjustable cheek-pieces have become more and more popular, especially as the objectives on the scopes have grown to 50mm, 56mm, and beyond. In order to get a good cheekweld while keeping the eye in line with the scope a raised cheek-piece has been required. This is a common problem. Often the individual's solution has been to purchase one of the various adjustable stocks on the market. The problems with this approach are not only that most adjustable stocks are significantly more expensive than their fixed counterpatrs, but they often weigh significantly more and may not be of a design that would be ideal for the end user. Of course, not all stocks are even offered with an adjustable counterpart. This is where the easy-to-install Karsten aftermarket cheekrest comes in. If you can mark and drill two relatively straight holes, you can install this on your favorite stock, even on your existing factory stock. It also has the advantage that it can be reinstalled on almost any new stock you may purchase in the future, the only requirement is that the stock you install it on is smooth on both sides. Of a saddle-type design, it is available in three designs and two widths. Aside from the width, the main differences between the two sliding units are the attachment screw types provided (flush allen head or thumb screw). The third design does not slide, screws must be removed to set it one of its six positions. easy to adjust on the fly by loosening the thumb screws and retightening at desired height. same as above except requires an allen key to adjust. ideal for ambedextrous shooting or those not wanting the protruding thumb screws. Install-and-forget, will not move under normal circumstances. Screws must be removed to adjust up or down. Determining the correct width is as easy as measuring the width of your buttpad. Wide model - approx. 1.75" wide (Bell & Carlson, H-S Precision, McMillan & Manners tacticals. If you are getting your stock from us, give us a call or email stockys@stockysstocks.com and we'll measure it, including the correct unit with the order. If you are unsure of the diameter, or if you simply want to fit your cheekpiece precisely to your stock get the narrow one and heat the top for about 15 seconds in almost-boiling water (wear gloves). Once it becomes slightly pliable from the heat, slide it over your stock and it will conform itself to the precise diameter. Stocky's take: I discovered these units when looking to scope my M1A. All the adjustables out there for it were too expensive or heavy for my purposes so I installed the Karsten for a perfect cheek weld. The only drawback I can see is in terms of the manufacturer's warranties, drilling the two holes will likely void it. But how often have you ever used a factory warranty on a stock, at least after the first few days, anyway? My suggestion is to drill both sides of the stock at 3/8" and install a bronze shop machine bushing in the hole on the side opposite of the female nuts provided with the kit. Lowes SKU# 215870 1/4 × 3/8 × 15/32 × 1/2 $2.92 each. All in all, incredibly pleased with this product, and shipping was 2 days to SC. I would highly recommed this to anyone looking to install an adjustable cheek riser.